The Hollow Center does not rotate. It has a removable point to allow for the long hole bit to pass through and is traditionally used with a little wax for lubrication. 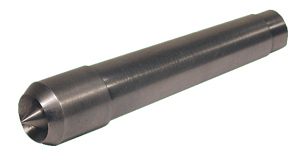 This center is designed for use with a 5/16" auger and is available in #2 Morse Taper.